It was less than one inning into Thursday's District 3 quarterfinal playoff game, but Delone Catholic wasn't playing like the tournament's No. 2 seed. Taking on Oley Valley at home, the Squirettes committed two errors in the top of the first and trailed by one with the bases loaded and one out. It was an unfamiliar position for a team that cruised through Division IV this season. "Just first (district) game nerves," pitcher Cassie Rickrode said. "We just had to shake it off. I was thinking, 'don't let them get base-hits, we can't have that this early in the game.'" Rickrode made sure that didn't happen, striking out consecutive batters to get Delone out of the jam. The Squirettes would pick up two runs in their half of the first before cruising to a 5-2 win over the Lynx. They will play No. 3 seed Kutztown in the district semifinals next Tuesday, with the winner guaranteed a berth in the state playoffs. While the Squirette's offense gave her some support, Rickrode powered Delone on Thursday with a typically dominant performance. The star senior pitched all seven innings and struck out eight batters while walking only two. 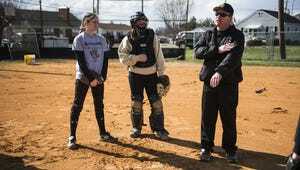 She didn't allow the second run until the seventh inning, with Delone leading by four. The Squirettes have become accustomed to first-rate games from Rickrode, who led the team to the Class AA title last season and registered 112 strikeouts and a 1.67 ERA in the regular season this year. Head coach Don Smith said the Squirettes are confident in any situation with the senior in the circle. "If she gives up more than two runs that's unusual," Smith said. "She throws strikes, makes them hit. And you never know when that changeup is coming, or that drop (pitch)." Offensively, Delone Catholic has relied heavily on the senior trio of Rickrode, Shelbee Holcomb and Katie Laughman to produce runs this season. While all three continued to sting the ball against Oley Valley, it was junior first baseman and No. 5 hitter Mikayla McCleaf who did most of the damage, going 2-for-3 with three RBIs. Although McCleaf typically takes a backseat to Rickrode, Holcomb and Laughman, she credited the "golden seniors" with helping her improve as a hitter this season. "I've learned everything from them so I give all my credit to them," McCleaf said. "They keep me calm, they've taught me since freshman year and I wouldn't be the hitter I am without them. They're still the golden seniors to me." Smith said the Squirettes need to hit better moving forward, but added that McCleaf's growth has been a huge boost for the team. He offered a theory as to how the junior has improved. "She just got new contacts, before she was wearing glasses but she wasn't even wearing them when she went up to bat because she couldn't get the helmet over them," Smith said. "I knew she couldn't see as good but now she's starting to hit better because she's got her contacts." Now on the cusp on their third straight state playoff appearance, the Squirettes are trying to take advantage of this year's talented senior class and go on another deep run. According to Rickrode, the players are staying relaxed despite the high expectations. "I don't think (winning districts last season) gives us more pressure I think there's just more motivation to do it again," she said. "I think we just want to go past the quarterfinals in states."